I’ve still yet to bring out the camera for a proper shoot. I did bring it to a night at a carnival, but the anticipation of taking snaps of crowds was moot, since there were probably only a good 30 ticket-holders that weekend night. I did get to test my fear of heights again, though I do blame it for the day-long headache right after. 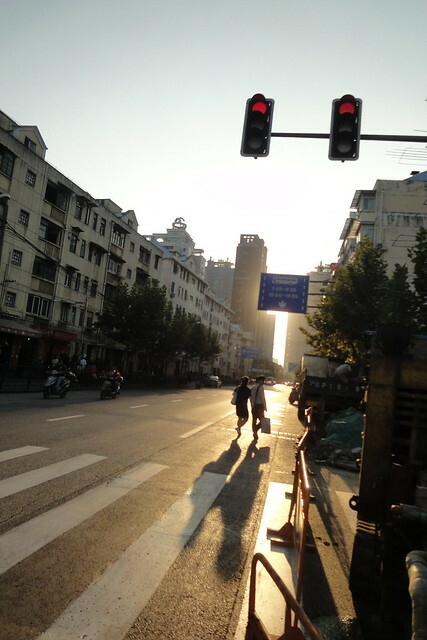 There’s still that intent to take city photos, and my getting one of these Shanghai Walks books should do the trick. I hope. I’ve also ceased clipping my hair. Determined easily that I should grow it for a change, despite the expected volume of white hair. The longest I’ve kept it was after college, during my first job. The bangs when extended can reach my chin, and it was oily slick of hair products. With this decision, I had to bring myself to a local hairstylist, which, if you consult the expat forums, is almost always a hit-and-miss thing. My hair was at a stage when the sides and back should be trimmed already, or else I would be sporting a mullet. I made a trip to Carrefour, and had the job done. Took a good 10-15 minutes. For 50RMB+, I found myself with a few strays along the ear upon closer inspection at home. One would easily miss the hour-long sits at the barber’s chair back home. There’s also the thing about going home for my birthday this year, but I do have to log a few work hours now, folks.